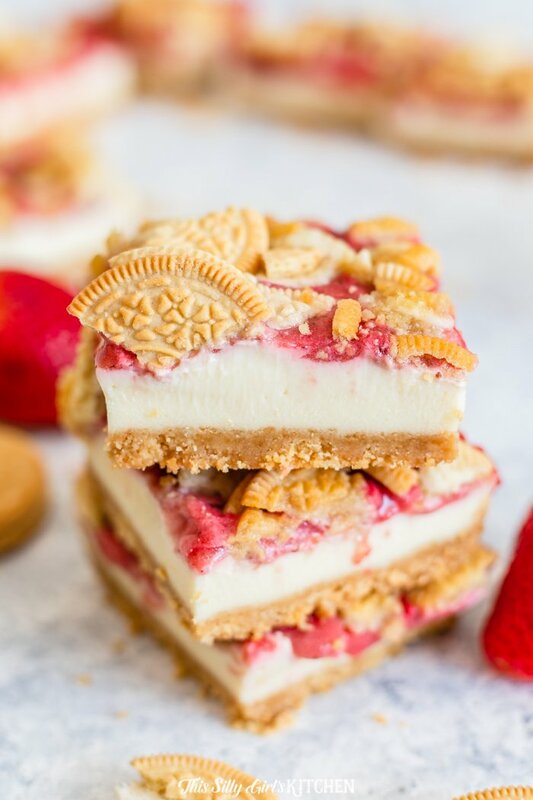 Strawberry Cheesecake Bars, golden Oreo crust with a creamy cheesecake filling, and strawberry sauce. 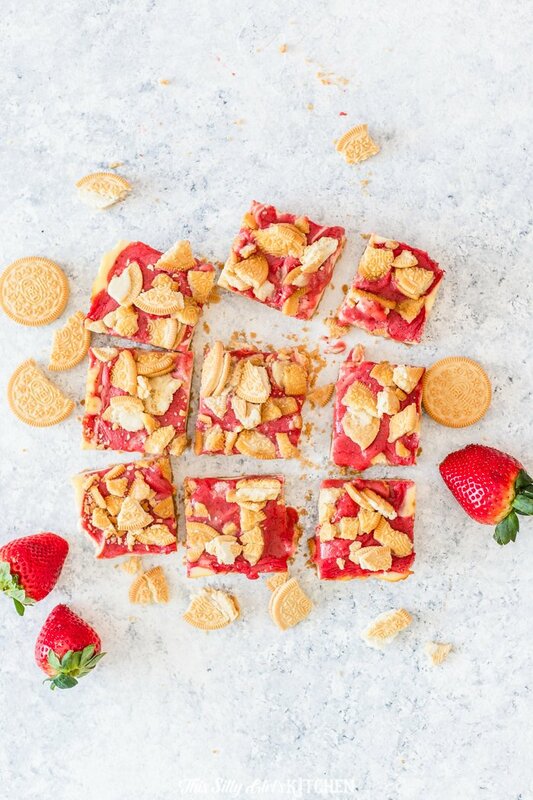 An out of this world, summer-time dessert, you will make these Strawberry Cheesecake Bars again and again! Oh man, I am sooooo excited to share today’s recipe with you! 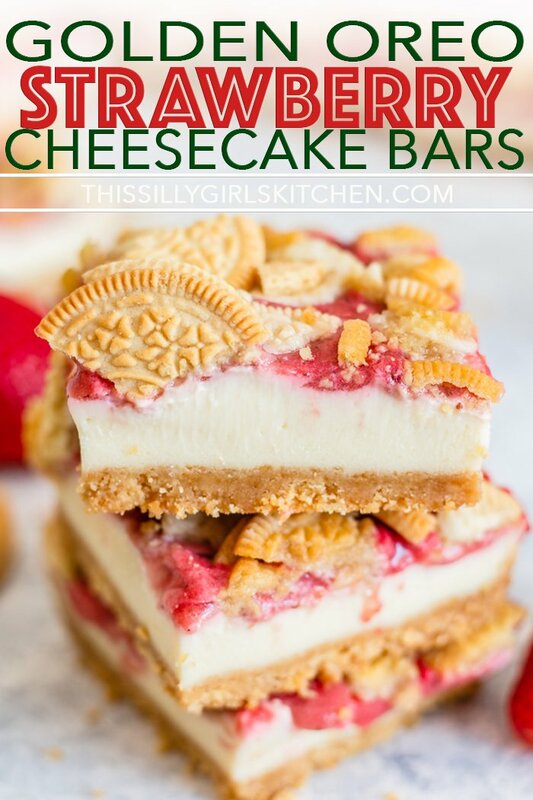 They have everything I love… Oreos, strawberries, cheesecake all in a little hand held bar! YES! I just wanna jump in the screen to have another bite, hehehe! 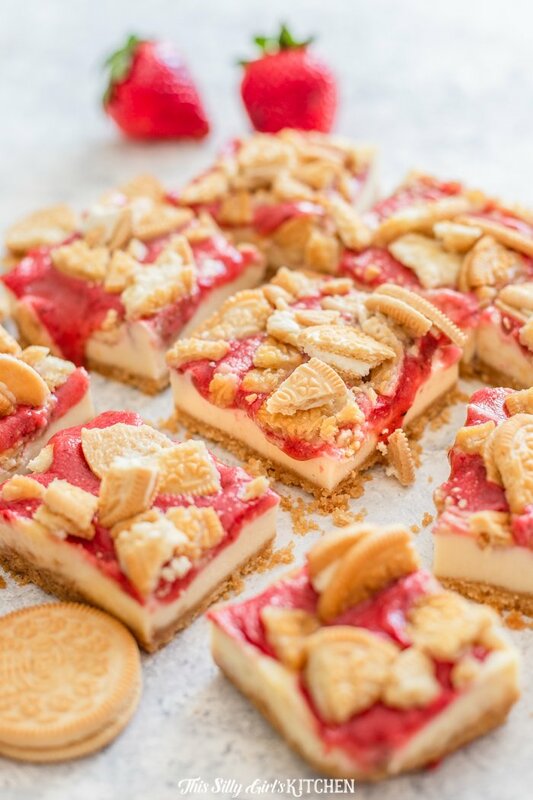 Take me to the recipe for Strawberry Cheesecake Bars already! Thank you so much for your eagerness to view my recipe. 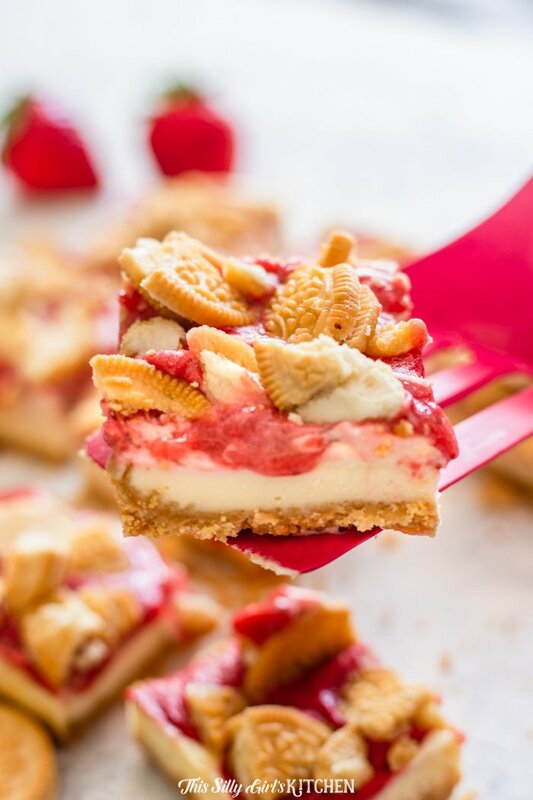 If you would rather not hear my super helpful tips and tricks, FAQ, and my overall awesomeness and get straight to this delicious Strawberry Cheesecake Bars – you can very easily scroll all the way to the bottom of this post for the full printable FREE recipe! Bon appetit. They are relatively easy too, so score! It’s a touch time consuming because everything is made from scratch, but to me, that’s half the fun! Unless you count cleaning up which is the one thing I hate most! Oh well! I got the recipe for the cheesecake filling from HERE. Oreo Cheesecake Bars are a delicious treat year round! Process half of the golden Oreos in a food processor. Add butter and process until fully combined. Press crumbs into a foil/parchment lined baking sheet or a non-stick baking pan. In a pot cook strawberries with water and sugar. Simmer for 10 minutes. Add in a cornstarch lemon juice mixture. Then using your food processor process the strawberries until smooth. Set aside. Make the cream cheese mixture by combining the cream cheese, sugar, vanilla, and egg. 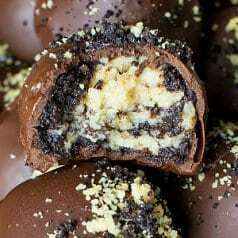 Then spread on top of your Oreo crumbs. Bake until cheesecake is just slightly jiggly. Let cool. Crush the remaining Oreos and sprinkle on top. Refrigerate covered until set (about 3 hrs). 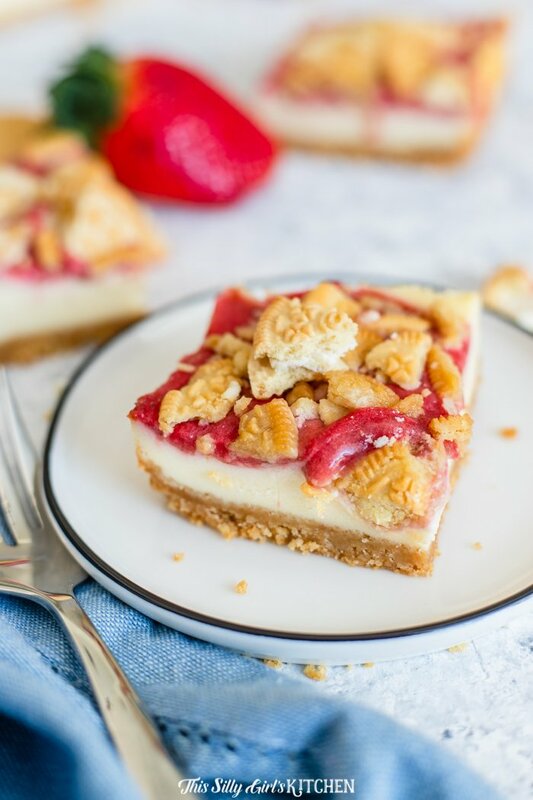 Can cheesecake bars be frozen? Yes! Simply freeze the bars on a plate and once frozen place in an airtight container and keep in the freezer for several months! The Oreos on top probably won’t be as fresh tasting but other than that they will be delicious! Oh yea, Jeremy tore these up to. You know how he is a cheesecake freak and he said these were like eating the real thing, score! I really love the addition of the Oreos, it might be my favorite part! 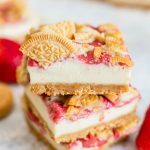 Aren’t these Golden Oreo Strawberry Cheese Cake Bars just gorgeous?! 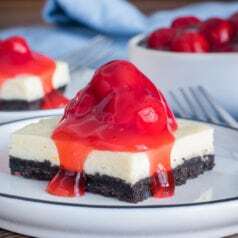 Golden Oreo crust, creamy cheesecake filling, and strawberry sauce! Preheat oven to 350°F. Place 18 golden Oreos in a food processor. Pulse until it forms crumbs, add in the melted butter and pulse again until crumbs are covered in butter. Press crumbs into an 8-inch baking pan lined with greased foil or parchment paper. Bake in the oven for 5 minutes, take out and let cool on the counter. Place strawberries in a saucepot with 1 Tbls sugar and 1 Tbls water. Bring to a boil, cover and simmer for 5-10 minutes until soft. You should stir this every few minutes. Combine lemon juice with cornstarch and stir into mixture and simmer an additional minute until thickened. Place strawberry mixture in blender and pulse until completely smooth*. Place in a bowl and set aside. Place cream cheese, sour cream, granulated sugar, vanilla, egg, and flour in a food processor. Pulse until smooth and combined. Pour on top of Oreo crust and smooth out evenly. Pour the strawberry sauce on top of cheesecake. Bake at 325°F for 36 minutes or until cheesecake is just slightly jiggly. Take out of the oven and let cool on a wire rack for 10 minutes. Crush remaining Oreos and sprinkle on top, gently pushing into the bars. Let cool completely on the counter. Place in a fridge covered and let sit for at least 3 hours until cutting into squares. 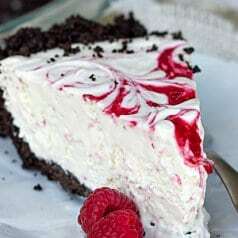 *This is the most important step if you do not want the strawberry sauce to sink into the cheesecake. I have made this twice now, and it’s absolutely delicious. My only thing is that my strawberries sink into the cheesecake when adding. What am I doing wrong? Strange, the only thing I can think of is the strawberry mixture is not getting thick enough. Make sure that you bring it to a boil after adding the cornstarch, it should be a thick syrup consistency. If it still looks thin to you, go ahead and add another 1/2 teaspoon cornstarch that has been mixed with 1/2 teaspoon of water so it forms a slurry. Then, let it come to a boil again, whisking constantly. I’m glad you liked the taste and made them twice already! Hopefully with these tweaks you will get that great layered effect. I just made these, and my strawberries sunk into the cheesecake, too. My strawberries were so thick that I couldn’t pour them easily, so I had to spoon the mixture out. I think maybe next time I’m going to put the strawberry mixture in the blender to get a really sooth consistancy, and see if that makes a difference. I also used all of the strawberry mixture because i didnt think half would be enough to cover all of it. The first round is in the oven now, can’t wait to try it! Okay, I’m currently making these for the 3rd time. These are such a hit! Blending the strawberry sauce has proven to be the way to go for me, as it lays on top of the cheesecake nicely when it’s good and smooth. 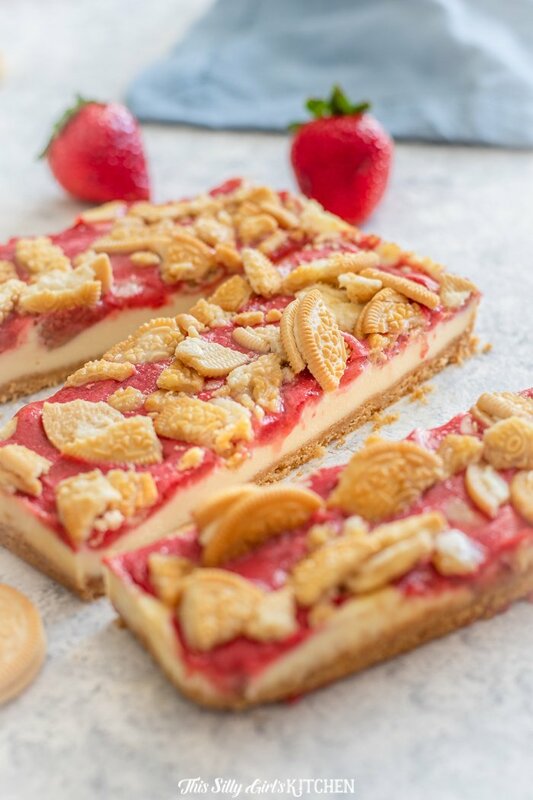 For the 4th of July batch I’m making right now, I’ve also thinly sliced some strawberries and put them in a layer on top of the crust before adding the cheesecake, and I’ll also add slightly e strawberries on top. I only drizzled the sauce in a zigzag design this time since I’m adding so many fresh strawberries. Can’t wait to try them! Yay, so glad you like them so much! Great choice to serve them today for the 4th! When I saw this recipe I just had to make them. I just made them and my strawberries did the same thing, sunk. I’m thinking the cheesecake mixture was just too thin bit I’m not sure how to fix that. Dana, so delicious! I chose to feature these at Snickerdoodle today! 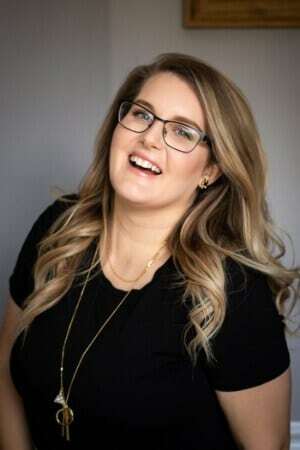 Hope you stop by for a visit!! I’m pretty sure I need the whole pan! Thanks for linking up with What’s Cookin’ Wednesday! These were wonderful! As Jessica mentioned above, my wife and I both think we will put more oreos in the crust next time. We reduced the amount of oreos on the top, and actually crushed them up in the food processor as well. That isn’t as pretty, but it makes storage and eating a bit easier. We also used the entire recipe of strawberry topping. That was just about perfect. We will definitely make it again. YAY, I’m so glad. Thanks for the tips! Made these yesterday….they got the most amazing reviews from the family I’ve gotten in years! They absolutely LOVED them!! Awesome! Thanks, my family love cheesecake, strawberries, and Oreos. I cut them into 9 even pieces, but they come out as large bars. I’m like drooling. Thanks for this recipe! Yummy! Also, where did you get the glass and metal sugar/flour, etc. containers on your counter? My niece brought this to a family gathering. It was a tremendous hit. Now I intend to test my hand at it.